Shortly after Halloween, we turned Elisabeth around. She’d been resisting the car seat for about a month by then when it finally occurred to me that maybe she was just growing up. Who wants to get into a car and face backward after all? At some point I knew that we’d need to turn her around but I’d held off as long as I could. Now it seemed the time had come. And it had. And we did. 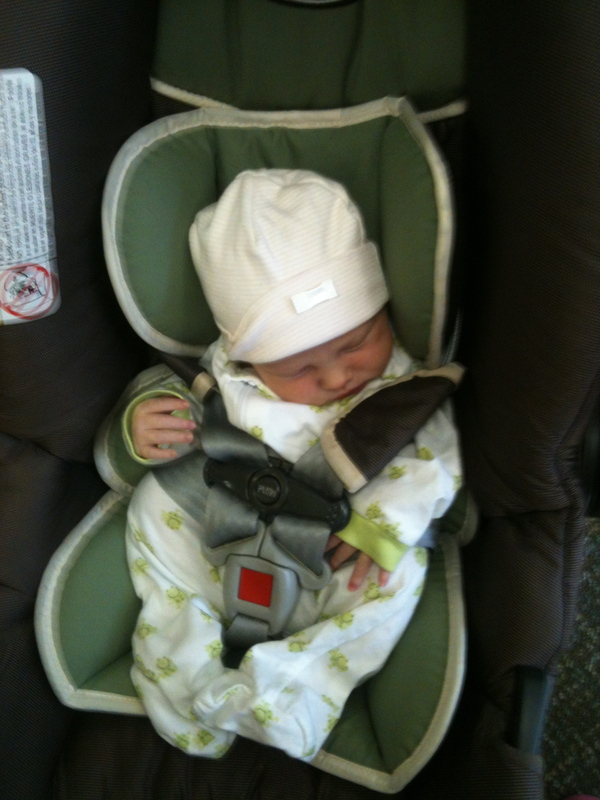 Elisabeth in her cat seat headed home from the hospital. If this looks unsafe to you, you’re right! Sadly, I didn’t know any better. When Elisabeth was about 3 months old, we’d traveled from home from Whole Foods with her car seat unbuckled. My sister Caroline and niece were with me at the time. I’d went into the back seat to get her out and I saw that she was just sitting there, completely unsecured. I think that I started to cry. It was that incident, the fact that we’d moved car seats and that she had fallen a few days earlier that prompted me to head to the North Durham EMS station on Milton Road to get the car seat checked. In those early days I remember being besieged with guilt for failing her on many fronts which now, with hindsight, seem to less “failings” and more lessons that all new moms need to learn. I took her words to heart. Elisabeth faced backwards for almost 2.5 years of her life. I thought I’d have to switch her sooner when she traveled in the car facing forward in Germany during our trip this summer (no car seats for toddlers have the option of being backwards) but she didn’t notice the difference when we came back here. The words of that EMT had been seared into my brain. But last month, Elisabeth would dawdle forever getting into her car seat or would resist so hard that I’d have to force her little body in just so we could get the two miles to school, I knew that we needed to make a change. How much do we not know as new moms when our babies are small? The plus is now, it’s less frantically trying to figure it out before disaster (imminent for sure) strikes. The first year was all about keeping our collective heads above water so we could both float in our sea of uncertainty. The second year is more about paying attention, to yourself and your child. Learning what to watch for. Anticipating what they might be looking for and needing. So far this third year feels centered around developing skills to tackle the stubborn pushback your toddler is doling out, sometimes unconsciously (“what schedule?”) and sometimes deliberately. Almost every time Elisabeth gets into the car now she says “turned around!” like it happened yesterday. The novelty will wear off but for now, she seems excited. Elisabeth is a real small person who actively adds to the conversation. She’s glad to be treated seriously, like a kid, not a baby. And while it might take me a bit to catch on (where is my toddler group?!) when I do, I no longer avoid an action due to fear. One of “developing skills” for sure!